"Seriously, do you make that many VoIP calls that you want to attach a handset to your keyboard? Because if you're making that many calls, wouldn't you just want to get a headset, preferably something wireless? Trust us, those things are much better than wedging a piece of plastic between your shoulder and ear while you type -- still, for those of you out there down the the idea of a handset nearby at all times and willing to give those bizarrely trapezoidal keys a try, A4 Tech will be announcing their new Talky keyboard at CeBIT this year. It works with Skype, MSN Messenger, Yahoo, QQ, and Net2phon, which leads us to believe that it's probably just an audio in/out, and isn't actually a USB VoIP device itself." PS: One of my precious and most jam-packed hard drives decided to crash (take this advise from a foolish old man: do NOT trust yellow snow nor a Maxtor OneTouch II!). Very unfortunately I lost some Mess.be related stuff, things that were ready to post. If you don't hear from me for the next couple of days, I'm either trying to recover the data or breaking the world record "hard drive tossing" in the French Alpes. Inky's story: Veni, Vidi, Microsoftie! Chief architect of Bot2K3, Inky, took a plane and crashed it into the Microsoft HQ in Redmond! Ok, don't take that sentence as gospel but the Dutch fella sure left his impression after talking to many Microsofties on his short U.S. trip last week, including some of the Windows Live Messenger folks like Leah (who in return left an impression on him, so it seems), James Baker & Danny Glasser. The result: an email today to confirm "that Danny Glasser from Messenger & Storage Services would like the opportunity to present you with an offer [...]". In other words: Inky's going back! I can't imagine a cooler place to do your internship than at Microsoft. Congratulations, Inky! Read the full story of his adventures in Redmond here and leave your props. This is one for the Sony PSP hackers out there. Davgav has written a Jabber-based IM client for your favorite handheld, called PSPJabber. The little homebrew software allows you to sign into MSN Messenger, AIM and ICQ. More information and a download link here (check out the comments and original forum post too). I'm afraid it only works with v1.50 firmware though. For those with updated firmware, there's always the alternative method of connecting to MSN Messenger with your Sony PSP that Timothy tested for us in May last year. Windows Live Messenger 8.0.0566: What else has changed? in your dashboard (that's the thing with your DP, nickname, unread e-mails, etc.) and select "Default" (strangely enough, not really living up to its name in this build) or another color of your choice. We already reported various changes even before the new Beta shipped last night, but further investigation always reveals more. Of course there are some minor changes we're not going to discuss in detail, eg. the style of the scrollbar in conversation windows, the new 3D default Display Picture, the return of the old tray icon, etc. First of all, this beta has been shipped to ALL markets worldwide. As a result, the Sharing Folders feature is now enabled for everyone. Hey, and if you don't like it, go to your Start menu, click Run and execute regsvr32 -u -s "%programdir%\MSN Messenger\fsshext.dll. And the MSN Video Carousel has made its debut in some new countries as well (it seems to depend on available content though). A lot of Messers have been confused by issues with contact blocking: the contact list doesn't properly reflect blocked contacts, but rest assured that in fact they still are. If you want to reproduce this bug yourself: block a contact, sign out and back in again. You'll notice that the blocked icon ( ) in front of the contact is gone. And there's good news for skinners: Timothy noticed the detachment of GUI resources from messenger.exe and msglang.dll. He also noticed the presence of something that looks like an option to process prepaid cards for VoIP/PC-to-phone communication. - You can use this Beta ONLY when you're invited. Many invitation links appear every week on Mess.be, but you could also leave your e-mail address here, cross your fingers and hope to receive an invite within 48 hours. >> Microsoft.com hosted installer here. Thanks Klue2k! >> Download at your own risk via Mytempdir or another Rapidshare mirror (via an anonymous tip). Fancy a free Microsoft USB drive? Don't be greedy: just one per person. Shipping will take about 6-8 weeks... or forever, in case they ran out. 1. Run auto-update again, keep the installer open. 2. Go to "Start" > "Run" > Type “%TEMP%" in the box > "OK". 3. Copy - Look for the WLM .566 installer .exe (filename is random, look for filesize around 13 or 14MB). 4. Copy the installer to your desktop to make sure it won't get deleted. 5. Close the 566 installer. 7. Run the 566 installer from your desktop. UPDATE: Anonymous people uploaded the installer to YouSendIt and Rapidshare. )(Rockerboy was the first Messer to report being auto-updated to the previously announced Windows Live Messenger 8.0.0566 Beta. Personally, I'm experiencing repeated crashes while installing the new build. If your "About" doesn't immediately reflect the new build number, we advise you to restart your PC. And a small update from our own timothy: "CustoMess is back in business!" The talk of the day in gadget universe is undoubtfully Origami: Microsoft's multifunctional tablet currently in development. A closer look at a product demo video "leaked" by marketing firm DigitalKitchen reveals that the cool wireless device can be used as a Portable Media Center, or for GPS navigation, gaming (Halo! ), VoIP, and of course -as you can see in the little image to the right of this post- instant messaging. We're expecting more details on March 2nd, probably at OrigamiProject.com. Meanwhile, check the video. - Nickname in black, personal status message in soft gray. - Once again, a new logo. - Word Wheel layout changed, Buddy List buttons now placed at the right hand side. - New icons for expanding groups. - Tab icons placed back inside the main window. - Less spacing between contacts. - Ink/type tabs on the right. As balupton and unforeseen have noticed, Live Contacts are now really "live". Check out your own and your contacts' contact cards to see it in action and edit the information. 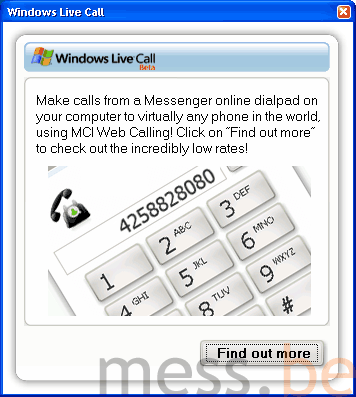 You'll read it here as soon as Windows Live Messenger Beta 8.0.0566 hits the web. After reading about the appearance of his patch in Clickx Magazine (and their call for an update), Koen from games.mess.be decided to add support for the latest MSN Messenger v7.5.0324. The custom games patcher adds more than a dozen of new games to your MSN Messenger launch menu, in addition to the official games you can play against your contacts. >> Download Custom MSN Games Patch v2.0.2. "Normally, you should think, that a company like Microsoft is offering highly integrated services and normally they do if you take the integration of Windows Mobile into the PC and server environment with all the sync functionalities, etc but now imagine you bought a new Windows Mobile Pocket PC, you would like to start using MSN Messenger the first time and a friend tells you, that you need a Microsoft Passport account. Not a big deal at all, since you have the Internet in your pocket and you should be able to easily create such an account right from your Pocket PC. Ok, so far the theory."